A 70-year-old building that has sat vacant for nearly two decades is tentatively being sold to the city of Woodburn. Woodburn officials and Ayesh Shanah, owner of the building known as the Pix Theater, located at 416 N. First St. in downtown Woodburn, reached an agreement that would mean the building's ownership would go to the city by the end of 2018. Under the proposed agreement, Shanah agreed to donate the value of the actual building to the city as a charitable contribution based on a private appraisal, according to a release from the city. In return, the Woodburn Urban Renewal District will purchase the real property for the Marion County Assessor's appraised Real Market Assessed Value of approximately $60,000. The city will satisfy up to $8,000 in delinquent property taxes, according to the release. Urban Renewal funds will be used to purchase the property and demolish the building. City Administrator Scott Derickson said in the city's release that the city would need formal bids to finalize demolition cost, but that he expects those cost to be higher than what he might otherwise anticipate due to potential environmental mitigation associated with the site. He added that once the building is down, the city will improve the site as a secure parking area for downtown until future plans can be developed. The final agreement is set for approval by the City Council, acting as the Urban Renewal Agency, in a meeting Oct. 22. The URA meeting begins at 6:30 p.m., prior to the 7 p.m. council meeting. 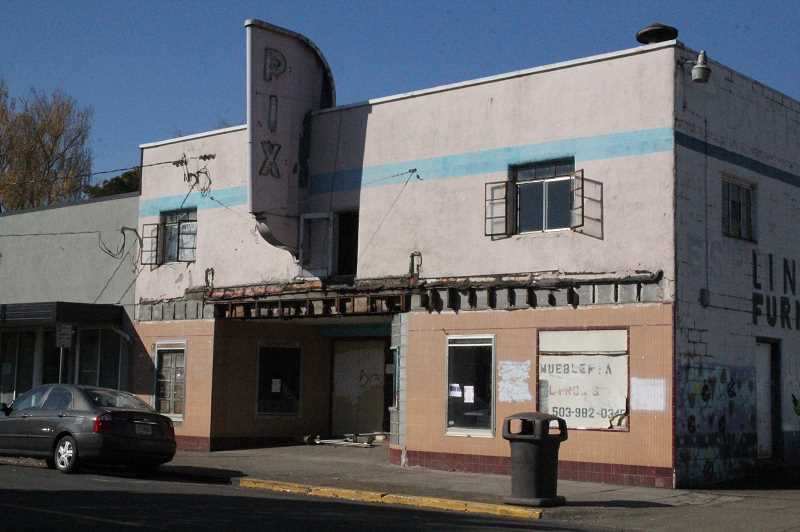 The Pix Theater, which is 5,660 square feet and built in 1948, according to the Marion County Assessor's website, has served as a theater and has also housed retail businesses that have sold furniture, appliances and clothing. According to the release, the building has become a concern for the surrounding neighborhood, noting more frequent complaints in recent years. "Due to the extensive environmental concerns associated with the building (mold, asbestos, lead paint, etc.) along with the structural condition, there does not seem to be an economically viable option of restoring the building," Jamie Johnk, Woodburn economic development director, said in the release. "It really is sad that the building has deteriorated to the point that it can no longer be restored." Johnk added that the demolition of a derelict building is the purpose of urban renewal, to consider the future economic vitality of the downtown area. "Timing the demolition with the First Street Improvement Project will have a positive impact on the revitalization efforts of downtown Woodburn," she said. The First Street Improvement Project, slated to begin in 2019, will feature sidewalk and road improvements, tree planting, upgraded storm sewer and lighting, added security cameras, an improved parking lot on Second Street and permanent striping. The project is budgeted to cost $4.47 million and is slated to be completed by February 2020.